Le Fils de la Ferme, in the 14eme, is so far my favorite restaurant in the 25-35 euro range. I’ve eaten here three times (two as part of the 2008 Sakai conference in Paris, once since we moved here) and each time was better than the previous. Shannon and I went on December 5th for dinner. For an appetizer, Shannon had the foie gras creme brulee and I had foie gras in a chestnut bouillon (in December, foie gras is ubiquitous in Paris). Both were sublime and reminded us of the best of our restaurant meals. For main courses, Shannon had sea bass with truffels and I had a venison “stew,” which was very refined and precise–not really a stew at all but a rich, elegant sauce for the perfectly cooked venison. This was all accompanied by a lovely Vacqueyras wine that fit perfectly with our selections (the truffles allowing the fish to harmonize with the rich red wine). Dessert was l’isle flottant and tarte tatine. Neither was particularly innovative but both were perfectly executed. When I went in July the server (I don’t know her name) was working incredibly hard to keep up. She was (is!) fantastic but definitely fell behind at times. With our latest visit, though, she had some help, which made a huge differance. Her natural warmth was accompanied by an efficiency and attentiveness that wasn’t possible when she was trying to serve the whole resaurant tout seul. We definitely hope that les fils keep the extra help around….it makes a big difference to the diners and, I’m sure, to the hostess. We don’t hesitate to recommend Le Fils de La Ferme to even the most discriminating diners. It’s very good (dare I say excellent?) and you won’t need a second mortgage. We made a trip to the Musée D’Orsay when Grammy-O was here (that will have another post, I suppose). There aren’t a lot of good restaurants right near the museum, but our handy Pudlo pointed us to a very nice Italian restuarant on rue Verneuil, Caffè Minotti. The decor is very sleek, with red and black leather dominating the bar area where we had lunch. 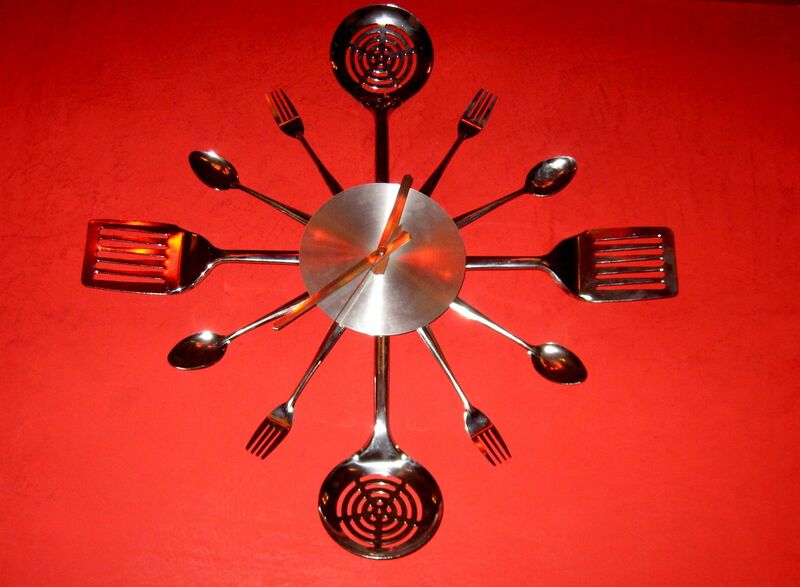 We really liked the atmosphere and the kids especially liked the cutlery clock. The menu is typically Italian, with an emphasis on risotto. And what risotto it was. I had the shrimp and Shannon had the scallops and they were both heavenly. For dessert, the kids split the panna cotta. It was presented beautifully, with each of the four flavors–Chocolate, Espresso, Earl Grey and Lavendar–getting its own small glass cup. Everyone’s favorite was the Lavendar. The espresso panna cotta was a bit rich for the kids which was good news for the grownups. Highly recommended if you’re in the mood for elegant lunch at a reasonable price. Menus at 26 and 32 euros. And right now their website is advertising a special promotion–they’ll send you home with a free bottle of wine of the kind you had with dinner! As part of Pia Myrvold’s art opening on Friday (see related post) we were treated to an excellent dinner atAlacazar, a very contemporary restaurant nearby. Unlike anything we’ve yet been to in Paris, walking into Alcazar gives you the feeling you’re in London or New York (or even San Francisco). It’s a big space, with the main restaurant on the ground floor and a loud and too hip bar on the mezzanine. We ate in le salon privé which is also on the mezzanine, happily separated from the bar by glass doors that controlled the sound. As Shannon said, this is the kind of place that caused restaurant reviewers to add sound ratings to their rating schemes–Alcazar would get 4 bells or a bomb from the SF Chronicle. Still, if you’re craving that hip, urban, bar-restaurant scene we would recommend Alcazar. We had a fixed menu (there was a group of around 40 people) which is difficult to make interesting and tasty but Alcazar pulled off both. The first course was smoked salmon with creme fraiche and caviar, served on a blini. It was really delicious and (we think) not just because it was 10pm (our usual bedtime!) and we were really hungry. The main course was chicken in a morel mushroom cream sauce served with asparagus. It was perfectly cooked, an accomplishment given that 40 people were served nearly simultaneously, but it did need a little bit of additional salt and pepper to brighten up the flavors of the gravy. This past Friday I took the day off from work to deal with administrative issues here. We went to St. Denis to meet with the Paris 8 staff who are going to help us get our cartes de sejour. We wrote about the struggles with the carte de sejours in a previous post and it turns out we don’t deal with the government ourselves–Shannon’s researcher status means that the folks at Paris 8 deal with it for us. More to come when we finally succeed because, after all, this is a restaurant post. Between the trip to St. Denis and some other errands, we stopped in the 1st arrondissement. I had scoped out a few possible restaurants and we walked by them one by one. The first restaurant I had previously visited in July with my old friend Reid Hoffman. If it hadn’t been the first we stumbled across we probably would have eaten there. After wandering past a few more and deciding they weren’t right for the moment, we decided on Au Dauphin. When we got to the address we couldn’t find it–it appears to have changed hands. Thrown for a loop, we struck out for Au Gourmand on the nearby Rue Molière. This seemed appropriate since Shannon had just seen Tartuffe two nights previously. 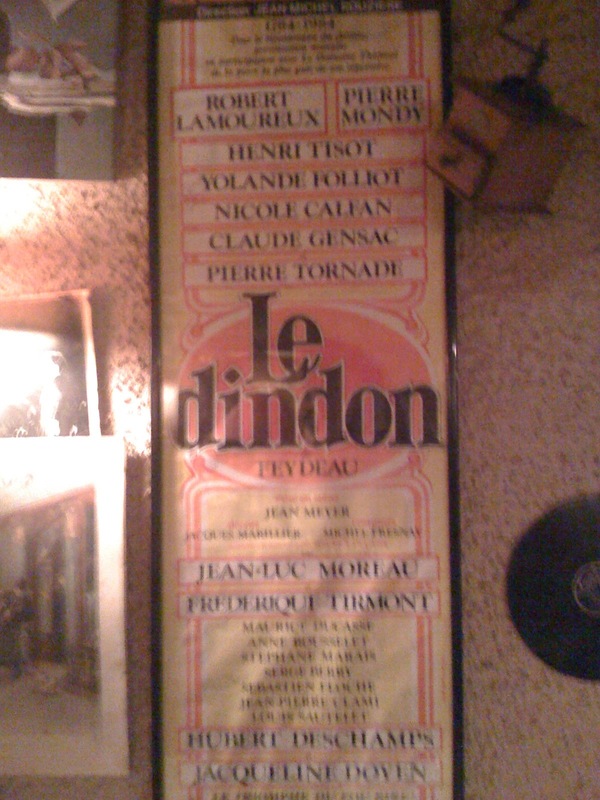 We had lunch recently at Christophe, a tiny speck of a place on Rue Descartes, just off the end of Rue Moufftard. Rue Mouffetard is a charming market street that has a number of desultory restaurants. If you find yourself ready for a meal as you’re walking up Rue Mouffetard please just keep going as Mouffetard becomes Rue Descartes and you’ll find Christophe where Rue Descartes forms a small plaza as it runs into Rue de la Montagne Sainte-Geneviève. Despite its small size (maybe 8 tables seating 25? 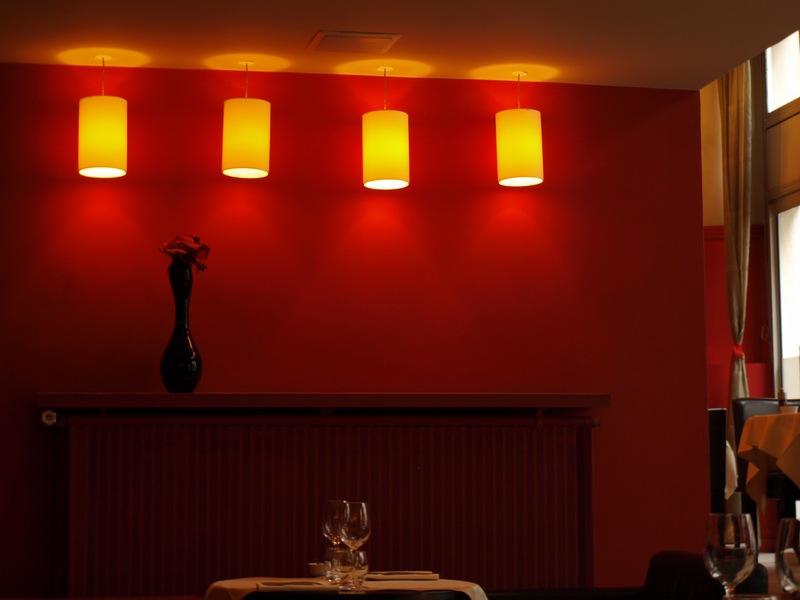 ), Christophe is elegant, with dramatic, vase-themed paintings on the walls and simple, contemporary place settings. I complained that it was a bit too quiet and they needed some music. Just then the bells from a nearby church started a long (15+minutes) and beautiful recital, solving the slight problem. We’ll be trying to write about food and restaurants while we’re staying in Paris. This is the first in (hopefully) a series….